American Swing Products was started in 1986. We are located in Reno Nevada, but sell nationally, as well as internationally. American Swing Products sells to schools, parks, government agencies, private schools, day cares, and individuals. Our products are new and innovative. We are always redesigning our products to include the latest technology to increase longevity and safety. American Swing prides itself on our service. If products are in stock, we normally ship within forty-eight hours. Our out of stocks normally run only 5% of our total inventory, therefore you can be assured that your orders will be processed quickly. We are dedicated to providing the fastest service available. Many of our swings have stainless steel inserts to avoid vandalism. Most manufacturers use only spring steel. In areas where there is heavy moisture and where the possibility of rusting is present, it is nice to have the choice of using stainless steel. When someone vandalizes a seat by trying to cut it in half, it exposes the steel to the elements, and eventually spring steel will rust and break. This can cause injuries to children. Although stainless steel is more costly, by using this material we eliminate the problem. Even our residential seats have a stainless steel insert around a stainless steel grommet. Most manufacturers use a plastic insert and may even use a plastic grommet. Our stainless steel parts are considerably more substantial. Everyone should be able to Swing! This ADA accessible Swing seat offers physically challenged children an advantage to help them swing. It is rotationally molded offering exceptional strength. 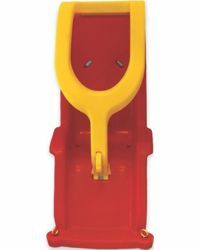 This swing has been designed to meet ADA standards, as well as the safety rules to meet both CPSC and ASTM standards. The new swing design offers added support. The sides are wider. The Jensen ADA swing has larger armrests as well as a larger footrest. The chains are adjustable to allow for different reclining positions.